What is Genie Shopping Network? The Genie Shopping Network runs long-established comparison shopping sites Crowdstorm and Cafe La Moda. 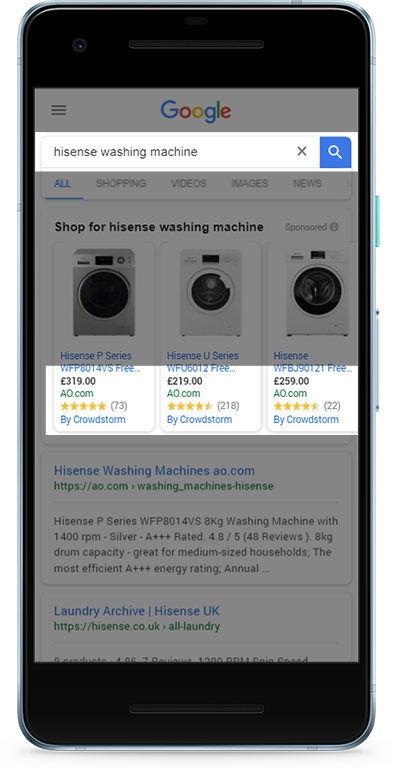 In September 2017, following an EU anti-competitiveness ruling, Google opened up its shopping product listing ads (PLAs) - and Crowdstorm was one of the first websites to be whitelisted as a Google approved comparison shopping site partner. Using our unique and award-winning Google Shopping feed management tool, we can now provide online retailers increased access to Google Shopping PLAs. Google Shopping ads: what's the big deal? The Google Shopping feed is taking an increasing proportion of paid search budgets in the UK because it works, driving sales for retailers and bringing in new customers. Shopping ads over-index in terms of clicks-to-spend when compared to AdWords, meaning it is set to become more competitive. But we can already provide expert insights into Google Shopping - and work with you to support your strategic objectives. Why choose a CSS to help me with Google Shopping? As Google approved Shopping partners, experienced CSSs (comparison shopping sites) can help optimise your affiliate or shopping feed to add incremental sales to your current processes on a CPA basis. Better still, running this through a CSS (rather than through Google directly) means you avoid having to pay around 20% of your bid value to Google – so you get all the benefit. So why should I choose Genie Shopping Network? Genie has been at the forefront of Shopping since it began, with our unique bidding software helping us become an award-winning Google Premier Partner (we were the ‘Google Shopping Innovation Award’ winner at the Google Premier Partner Awards 2017, where we were also in the top three EMEA agencies for both ‘Growing Businesses Online’ and ‘Search Innovation’). Either way we’ll bring you additional sales and quality new customers, at no risk to you – we don’t compete with your existing paid search activity, so all you’ll see is your category share increase. All we need is a data feed, including EAN. We can then enhance your data feed using our feed management tool: because the more information, the better the results. We can either track through an affiliate network, or take a direct feed and apply tracking to your site. We agree a CPA and that’s it - we’re ready to go.